YuppTV Blog: IPL 2018 starts with a Bang: Which popular captain can strike the Gold? IPL 2018 starts with a Bang: Which popular captain can strike the Gold? Vivo IPL 2018 as the eleventh edition of Indian Premier is called this year, is going to commence tomorrow and we are more than excited for the tournament. The cash-rich tournament that involved some of the biggest deals in the history of sports will continue until 27th of May- During the course of which 60 matches will be played amongst 8 different teams namely Sunrisers Hyderabad, Mumbai Indians, Delhi Daredevils, Kolkata Knight Riders, Royal Challengers Bangalore, Kings XI Punjab, Chennai Super Kings and Rajasthan Royals. The tournament will be played in a Double Round Robin Format which means that every team plays against another team twice. The matches are organized in 9 different cities and every team will be playing two league matches once on their home ground and once away. The first match is between Chennai Super Kings and Mumbai Indians and is organized in the Wankhede stadium of Mumbai. IPL 2018 comprises of great players from India like MS Dhoni, Virat Kohli, Rohit Sharma, Gautam Gambhir, Suresh Raina, Jayadev Unadkat, Bhuvneshwar Kumar, Shikhar Dhawan, Dinesh Karthik, etc. Players from other cricket playing nations include Ben Stokes, Chris Lynn, AB DeVilliers, Brendon McCullum, Andre Russell, Jofra Archer, etc. Of all the teams the Royal Challengers Bangalore, Chennai Super Kings, and Mumbai Indians are proposed to be the strongest by the experts and have a better winning chance than the others. Chennai Super Kings had been the strongest team in IPL has lifted the trophy twice and had been the runner-up four times. The team which is back to IPL after two years of Suspension has Dhoni as its leader, Suresh Raina, Dwayne Bravo, Shane Watson, Ravindra Jadeja, Kedhar Jadhav, Faf Du Plessis, Harbhajan Singh etc. Royal Challengers Bangalore, on the other hand, had never won the title but had been in the finals 3 times in the past. This team consists of the present Indian Captain Virat Kohli leading, AB de Villiers, Chris Woakes, Yuzvendra Chahal, Brendon McCullum, Washington Sundar, Sarfraz Khan, Quinton De Kock, etc. Mumbai Indians, led by Rohit Sharma holds a unique record of winning the IPL trophy thrice. In the 2018 team, it has players like Hardik Pandya, Jasprit Bumrah, Kieron Pollard, Pat Cummins, Mustafizur Rahman, Ben Cutting, Akila Dananjaya, etc. The three teams look equally strong to win the trophy with their ultimate blend of Ace Batsmen, Bowlers, and All-rounders, but given the unpredictable nature of T20s, only time can unravel the winner of the trophy. YuppTV has bagged the digital rights to live stream IPL in countries like Australia, Singapore, Malaysia, South America, Continental Europe (Except UK) and South East Asia. Watch the entire IPL 2018 live on YuppTV to enjoy the unlimited cricketing action for two months. 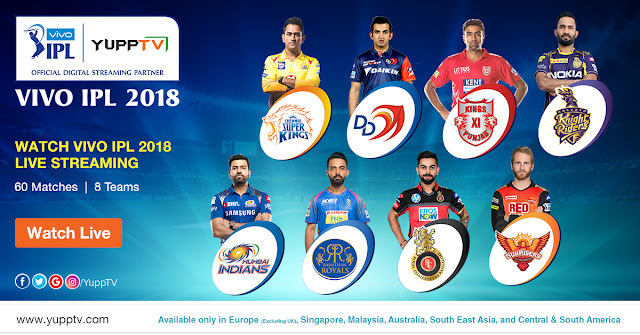 YuppTV also introduced an offer to watch IPL 2018 live for free from the above-mentioned regions. All you need to do is subscribe to any of the featured language pack for a year and enjoy the entire series of IPL for free. Users that are already subscribed to YuppTV can enjoy the cricket matches for a bare minimum price. Check out our packages for more details.